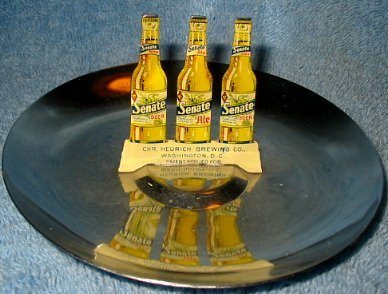 Lithographed Ashtray – Heurich Senate Beer & Ale pre-prohibition ashtray. 3 detailed lithographed tin bottles on a chrome metal tray. 2 beer bottles with an ale bottle in the center. Super condition on this early tray. The orange spot in the photo is flash refelection. Tray is 4 3/4 inches round and bottles are 2 inches high.